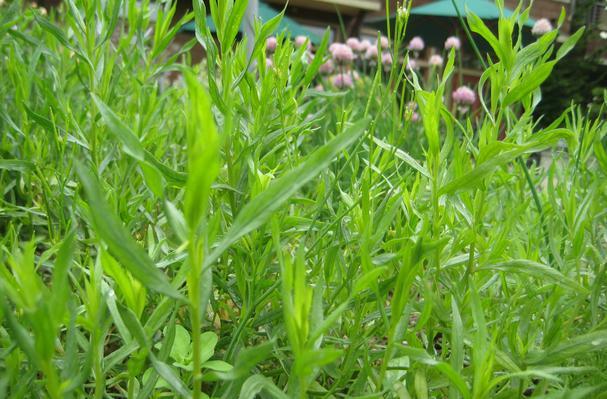 Tarragon is an herb with narrow, pointed, dark green leaves, and is known for its anise-like flavor. During summer there are a lot of fresh leaves you can use for salads, but for the rest of the year, the leaves are dried and used for flavoring vinegar, sauces, soups, and pickles. Tea prepared with tarragon is a French home remedy for treating insomnia and hyperactivity. Homemade vinegar prepared with tarragon can also help in treating digestive disorders. Tarragon leaves are lance-like and bright glossy green. Choosing: Look for leaves that are not brown or wilted. Tarragon should be lightly aromatic. Buying: Tarragon is widely available at most supermarkets. Look for fresh bunches at farmers markets throughout the summer. It's available dried online and at most supermarkets. Procuring: Tarragon grows to two or three feet tall and likes moderate sun, preferring a little shade during the warmest part of the day. It grows well in a rich loamy soil that holds moisture, but drains well. Mulching is beneficial to this end. Tarragon may also be added to rémoulade, a mayonnaise-based sauce characterized by the inclusion of capers and chopped gherkin pickles and served with cold meat or fish. Tarragon is used to flavor a popular carbonated soft drink in the countries of Azerbaijan, Armenia, Georgia and, by extension, Russia and Ukraine. Cleaning: Rinse lightly and trim the ends. Shake to dry and store in a sealed plastic bag. History: The English name derives from the French estragon, which means little dragon. People have speculated that the name refers either to the shape of the twisted roots, or that it had a connection with beasts at one time, being thought to cure the bites and stings of both mad dogs and other venomous creatures. Hold stem at the tip with your fingers and slide fingers gently down the stem toward the base to remove leaves. Discard stem, and chop the leaves.